Arguably the Blue Mountains most recognisable icon, the ‘Three Sisters’ rock formations are located at Echo Point, Katoomba overlooking the world heritage listed Jamison Valley. 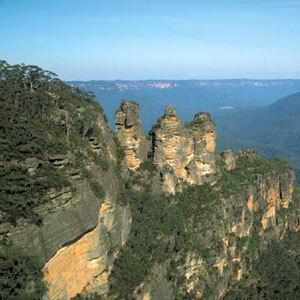 The valley itself is part of the 2,482 km2 Blue Mountains National Park. According to Aboriginal legend, three sisters were turned to stone by a medicine man who sought to protect them. A number of lookouts provide great position to see these unusual formations. For the serious thrill seeker you can hike out to the Ruined Castle and if it’s the overnight experience you're after, then camp out at Mount Solitary and return back to Katoomba the next morning. The Jamison Valley is a part of the Cox's River canyon system and an extremely popular hiking and bushwalking area. The cliffs surrounding the valley reach heights of up to 1000m, whilst the valley floor is densely forested. 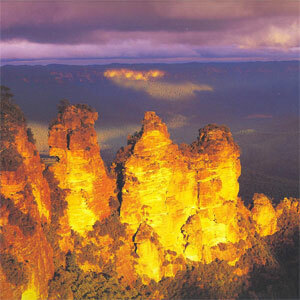 The town of Katoomba is situated on cliffs overlooking the valley. Possibly the Blue Mountains most popular tourist attraction, the Three Sisters rock formation, is located on the edge of the valley and can be best viewed from here. 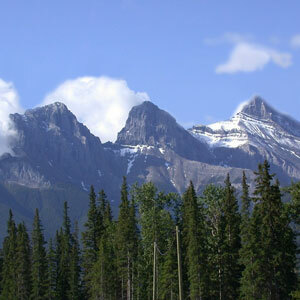 The Three Sisters are 922, 918 & 906 metres tall, respectively; Over 3000 feet above sea level! The Aboriginal dream-time legend has it that three sisters, 'Meehni', 'Wimlah' and Gunnedoo' lived in the Jamison Valley as members of the Katoomba tribe. These beautiful young ladies had fallen in love with three brothers from the Nepean tribe, yet tribal law forbade them to marry. The brothers decided to use force to capture the three sisters causing a major tribal battle. As the lives of the three sisters were seriously in danger, a witchdoctor from the Katoomba tribe turned the three sisters to stone in order to protect them from any harm, with the intention of reversing the spell when the battle was over. The witchdoctor however was killed during the battle and so the sisters have remained in their magnificent rock form as a reminder of this battle for generations to come.